This newspaper is just the coolest thing. 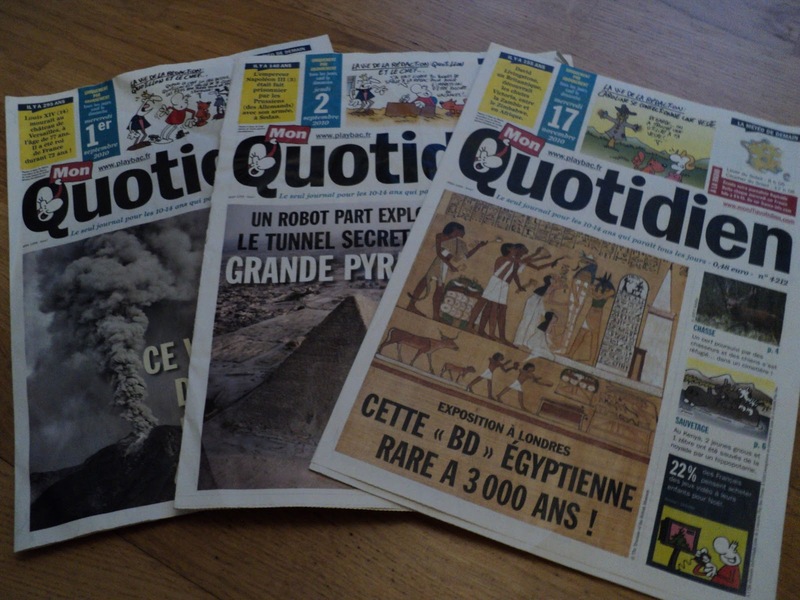 Mon Quotidien, or My Daily, comes five days a week in the mail (excluding Mondays) and is well written for the level of a ten- to 14-year-old. This has greatly helped those of us who don't speak French as a first language and want to know what their kids are reading. Alex and I have had many interesting, in-depth conversations about current events thanks to this publication... everything from the U.S. oil spill to the French elections. In addition to the high cost (currently 92 € for ten months) there's just one problem: Did I mention it comes five times a week? And therefore, copies of this newspaper have graced the dining room table, the living room table, Alex's bedroom floor, the bathroom, etc... You get the picture. My Daily was lingering for weeks until we'd gather them up and unload them on some other willing parent. His most recent subscription just expired a few weeks ago. I haven't yet gone into withdrawals. I soon will... My little reporter was keeping me well informed on news from the French perspective! 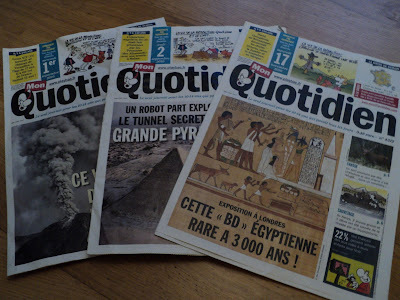 I'm editor of the Bothell-Kenmore Reporter in Washington state and was contacted by a Mon Quotidien reporter, Cecile Pinault, who wrote a story that we also covered for our paper. It's about Rachel Beckwith, 9, of Issaquah, WA who was killed in a car accident and donated money to charity:water ($1 million was raised overall following her death). I guess a photo of mine ran with the story. I was wondering if you had a copy of the story, which ran in August, that I could see via pdf or jpeg form.